With 2018 coming to a close, here the Investing News Network takes a look at the biggest medical device trends of the year. The US medical device manufacturing industry is estimated to reach revenues of US$39.5 billion in 2018, and is expected to grow at a compound annual growth rate of 3 percent over the next five years, according to an IBISWorld report. In 2018, major medical device trends included merger and acquisition (M&A) activity taking precedence over research and development (R&D), new technology developments and regulatory activity. Medical devices play an essential role in the healthcare industry, which is why the market experiences less volatility, IBISWorld says. But because of its higher price tag, the medical device manufacturing industry is slightly more vulnerable to other economic fluctuations. Pricing pressure, however, has driven down device pricing, Supratik Paul, associate vice president of research and healthcare at BIS Research, told the Investing News Network (INN). Organizations such as Medicare and Medicaid have contributed to this pricing pressure, he said. With 2018 coming to a close, INN is looking back on the year the medical device industry had, with insight from experts on what went on. Read on to learn more about medical device trends. M&A as a business model isn’t new, but companies are increasingly using this model instead of investing in their own R&D, IBISWorld says. The firm adds that R&D costs have not changed significantly over the past five years. Stryker (NYSE:SYK), one of the world’s largest medical device companies specializing in surgical robotics, is a prime example of this. In 2018 alone, the company announced five acquisitions, including SafeAir, K2M, Invuity and HyperBranch Medical Technology. Looking at the company’s R&D costs, in the last three years Stryker only increased R&D expenses by 10 to 14 percent each year in every Q3 starting in 2016. Similarly, Microbot (NASDAQ:MBOT) acquired a patent-protected technology from CardioSert to expand its portfolio and complement its existing technologies. Paragon Medical was acquired by NN (NASDAQ:NNBR) early in Q2, the latter of which has a wide range of production and engineering capabilities. This acquisition will provide new options for NN, as its previous focus was directed more on industrial sectors such as aerospace, automotive and electrical. Paul agrees with the medical device trend of increased M&A activity, and pointed out that this surge in market consolidation drove prices down, impacting the margin for manufacturers. Hospitals and group purchasing organizations also played a part in this M&A surge, Paul said. M&A activity wasn’t the only medical device trend in 2018. Another is that current technology is advancing to meet demand for home medical devices, IBISWorld says. As larger companies take advantage of acquiring smaller companies with new technology, investors need to consider which side of the equation is better to invest in — smaller companies that could be acquired or larger companies making acquisitions. IBISWorld categorizes technology products and services into segments, putting cardiovascular devices as the largest at 23.6 percent. However, due to lower diversified innovation in the cardiovascular device segment, there has been a low growth rate for these devices. Other devices noted in the report are continuous glucose monitoring (CGM) devices. Dexcom (NASDAQ:DXCM), Medtronic (NYSE:MDT) and Abbott (NYSE:ABT) are a few of the biggest players, but Nemaura Medical (NASDAQ:NMRD) could soon be another big name. The company has had an eventful year working to develop its CGM, called the SugarBEAT. This product is different from others as it monitors glucose for up to 24 hours. The company believes this will allow a new range of customers who don’t want to commit to other devices worn for longer. Nemaura also completed its FDA De Novo 510(k) submission later in the year, and plans to submit it in Q1 2019. Investors can expect to hear about the device’s initial launch in the UK, which should take place by the end of 2018. “With the increase in the complexity of the devices, time required to get FDA approvals increased,” Paul said. This has impacted innovation adversely, he added. The report continues to explain that some “risks” with devices aren’t noticed until they are more widely used, meaning all future information contributes to a device safety profile. In early December, the FDA proposed improvements to its De Novo device submission pathway “to advance safe, effective, and innovative treatments for patients.” The agency intends to create more efficient and transparent processes by ensuring the requirements and review are clear. The agency is also being held in check by the power of documentaries. The Netflix (NASDAQ:NFLX) original movie “The Bleeding Edge,” released in July, brought into question the safety of five devices that the movie claims are unsafe for patients. Investors may want to keep an eye on AVITA Medical (ASX:AVH,OTCQX:AVMXY), which received FDA approval to expand its investigational program to include more patients and trial locations. The company’s Recell Autologous Cell Harvesting Device has the potential to allow medical professionals to use a patient’s cell samples to create a suspension, called a Regenerative Epidermal Suspension, and use it to regenerate wounded skin. In the trials, the device is being tested on patients with insufficient healthy skin available for conventional skin-grafting treatments, or whose treating physicians believe there is no suitable alternative treatment. Preparing for the device’s launch, the company has hired a full US sales team and received US$40 million from an institutional placement to support its commercialization. Looking ahead, these medical device trends are only a few that investors may want to watch. Paul said that this year added a push towards integrated IT solutions with medical devices, which BIS Research had been expecting. There was also an increase in cyber attacks despite investments in firewall software systems. BIS Research did expect a bigger emerging market from Latin America and the Asia-Pacific regions, but this was quieted from a lack of cost effectiveness, Paul said. As for Europe, the General Data Protection Regulation “impacted sensitive patient data handling which in turn affected the designing and development of medical devices.” The European Commission developed these rules for the benefit of people having more control over their personal data and businesses. 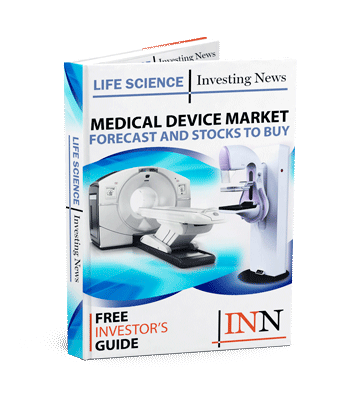 Titan Medical (TSX:TMD,NASDAQ:TMDI) CEO David McNally added that a challenge for development-stage medical device companies is raising capital. In Q3, Titan closed a public offering worth over US$19 million. The company attributes this offering to uplisting to the NASDAQ earlier in the quarter, which provided “access to US-based institutional investors,” McNally said. Though regulatory agencies and technology may be slowing the path to approval — and increasing its cost — medical devices are vital to the healthcare industry. This innovation coupled with new safety measures could be the perfect match for improved medical devices.